A customer within walking distance of my shop texted me that he had a Mongoose CX that he wanted to upgrade. The name "Mongoose" doesn't immediately bring to mind anything that I'd want to work with. But I said that I'd swing by and take a look. 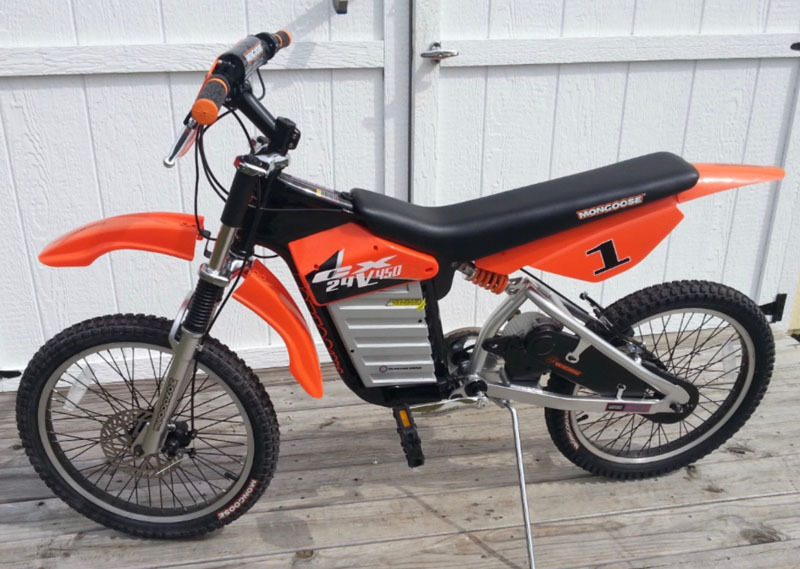 The bike was actually kind of nicely proportioned and this particular copy was in decent shape. Eyeing the tiny Currie motor and knowing from the bike's name that it was a 24v system, I didn't see much that could be done without spending way more money than the bike was worth. I talked to the owner about maybe getting a 36v or even 48v 18650 battery pack and a decent controller larger than a deck of playing cards. 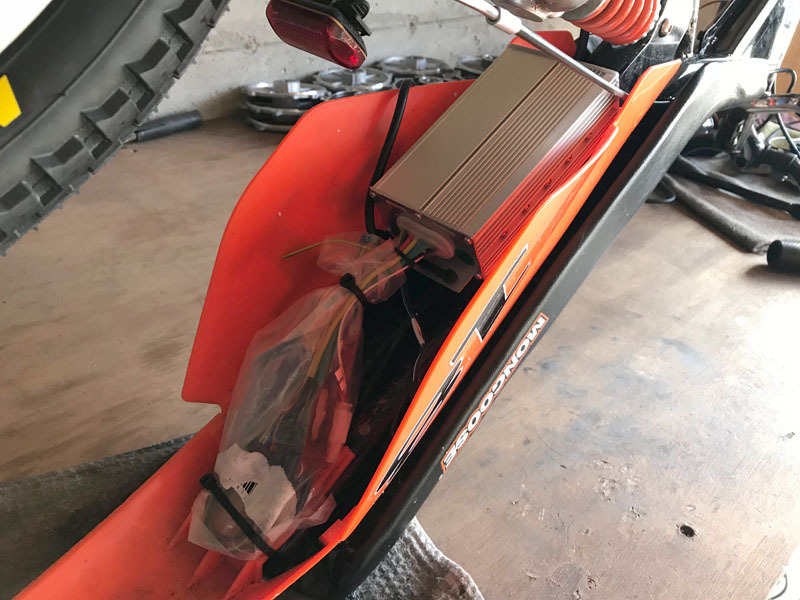 The more I tried to convince him not to spend money on the bike the more determined he was to have a small block swingarm drive, 52v 50A battery and a quality controller. Who was I to argue? His bike, his money. I told him to drop the bike by when he was ready. 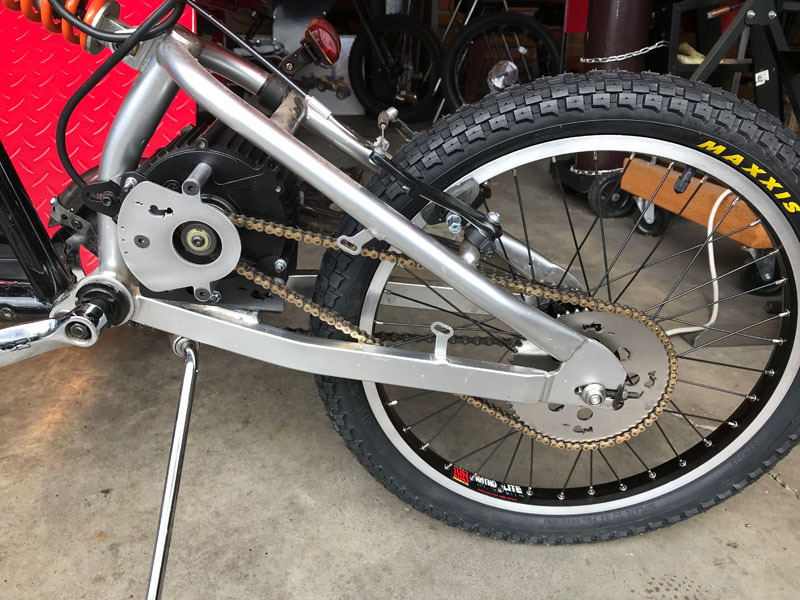 The swingarm has a decent mounting pad with adjustment slots so that the chain tension of the motor could be synced up with the tension of the pedal run. Things were looking better than I expected. 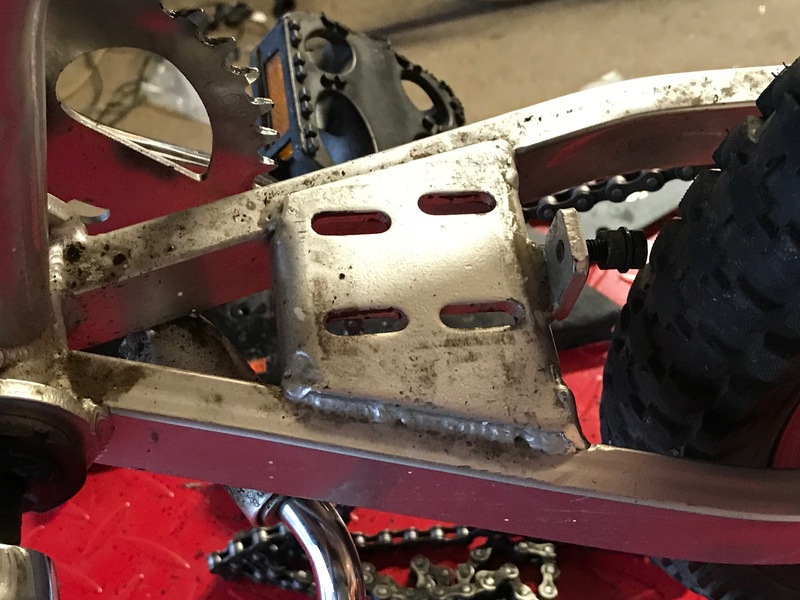 I took a Qulbix swingarm bracket for my Big Block, narrowed it to fit the Small Block, and then welded a new 10ga base on it with holes that matched the slots on the mounting pad. The original motor had a slotted upper adjuster that helped keep the motor straight when moving on the swingarm pad. I cannibalized the upper slide and fabricated a bracket to fit it to the Small Block. The Small Block fit the space in the swing arm like it was made for it. Since the Currie motor had a reduction box the Mongoose could get away with a tiny rear freewheel sprocket. I convinced the owner to deep six the original hub in favor of a disc brake hub that I could soild mount a 6 bolt sprocket to. By going to a larger #219 rear sprocket I was able to get good reduction without the gear box. The solid mount to the hub makes regenerative braking possible. 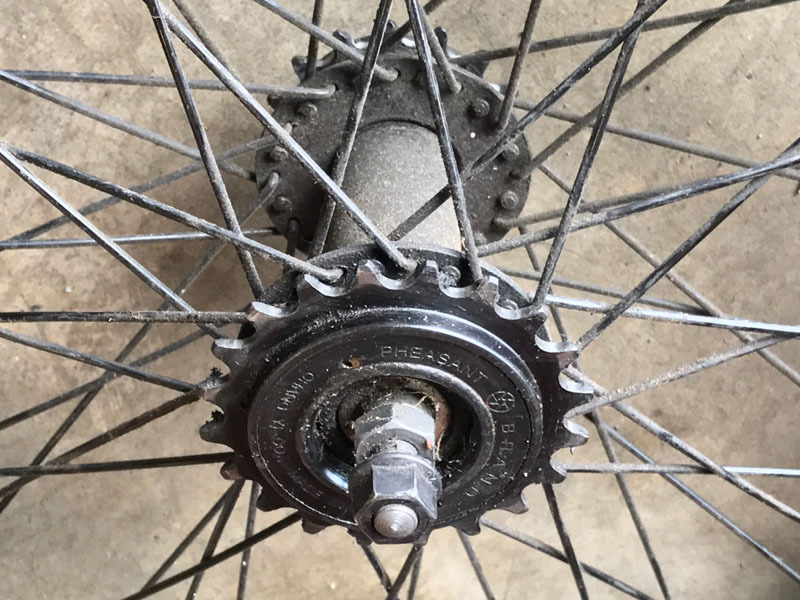 The original hub with pedal side freewheel. A nice Surly hub with an ACS chrome moly freewheel for the new pedal side. The original motor driven freewheel sprocket. Well suited to the original power level of the bike. 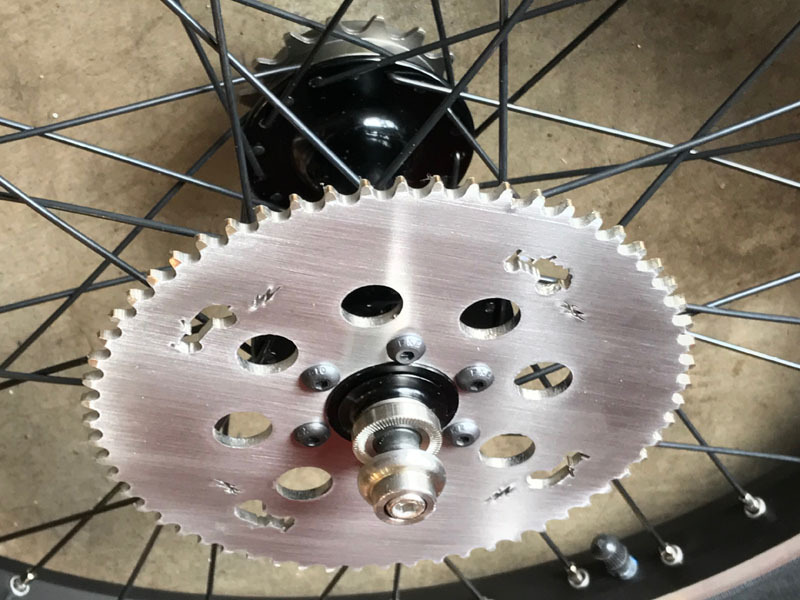 New stainless steel 60t #219 driven sprocket. The six bolt disc brake mount will be a trouble free setup for 2500 watts. Everything clears, both chainlines are perfect. I can't believe how well suited this little bike is to this conversion. The mid drive part of this project is completed. Waiting now for the 14s5p battery pack from EM3EV and Bluetooth programmable sine wave controller from PowerVelocity. 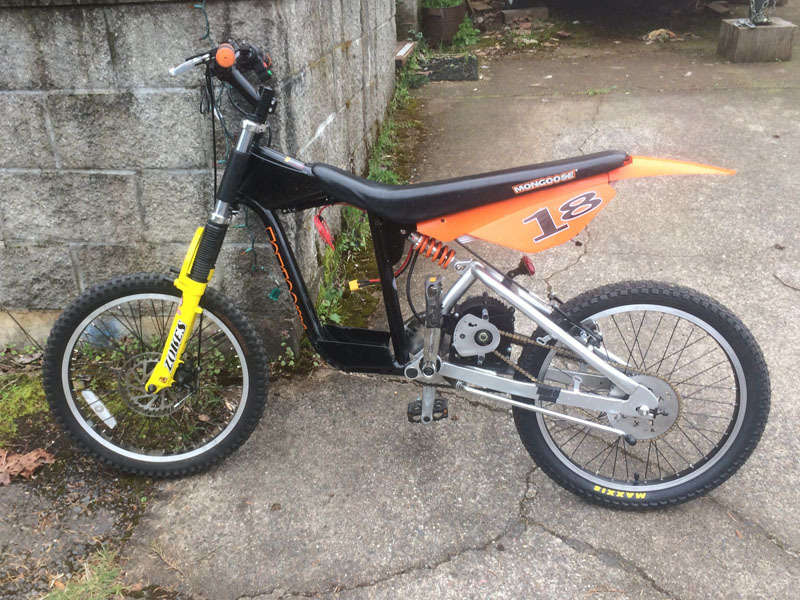 The owner is now shopping for quality front forks that will fit this unusual size bike. He will have nothing original left but the frame and maybe the seat by the time he's done. And- he's already talking about doing the same to another one of these that he has squirreled away in his bike stash- that one for his daughter to ride. One thing you can say, he won't be riding the same boring bike that everyone else is riding. I gave up trying to get one of those, I'm thinking Reid Welch was the first person here I was reading up on with those. EvolutionGTS had quite a bike, he replaced the forks, etc. I'm wondering about the new gear ratio. Also, what we WERE calling the Big Block isn't available anymore, right? What exactly is your Small Block? The new gear ratio is 12/60t or 5:1. This bike is really light, the rider is a featherweight, the bike has 20” tires, and it now has 6x the power it had previously. The top speed will be close to 40 mph @ 52v which is what the owner is looking for. I have Big Blocks, Mid Blocks and Small Blocks. They are getting hard to find. 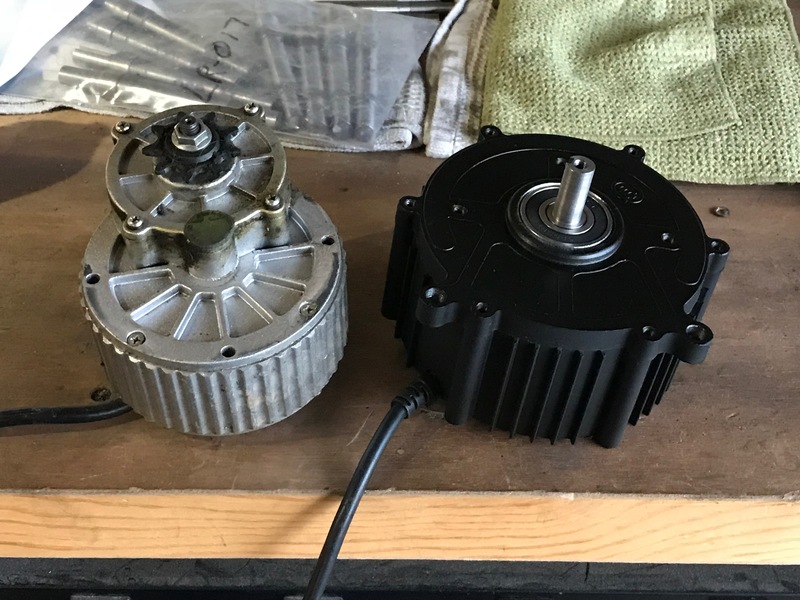 I’m testing a new line of motors. I’ll try to find that other Mongoose. Thanks! There's a guy near me that posts these on craigslist all the time. Guess he bought a container or something cause he has tons of them. Selling for 1000$ each. https://cnj.craigslist.org/bik/d/mongoo ... 48413.html Wonder if he's tested all the batteries to see if they'll still charge. I think Nutspecial had a bunch of used Mongoose CX's for sale on a old thread not sure if he liquidated it all yet or not. The owner of this ‘Goose is going a bit crazy. He just signed on for a PowerVelocity sine wave controller with Bluetooth. He’s also bought new front forks. We’re building a Porsche beating Civic. Good idea changing the fork, increase one size on front tire for tall people. I wonder if it would ruin the ride height, can adjust rear suspension? The owner isn't tall but he is adult sized. He's thinking the same as you, he's getting a 24" front wheel. The back shock isn't adjustable and of course being OEM China equipment it's cheap garbage. He's looking for a better quality shock that is just a bit longer to raise the rear end. It's always crazy doing these kind of silk-purse-from-sow's-ear kind of projects, but there are very few bike or car nuts who haven't done it. I've built all sorts of nutsy cars over the years. Yes, most of us have done a project like that.. 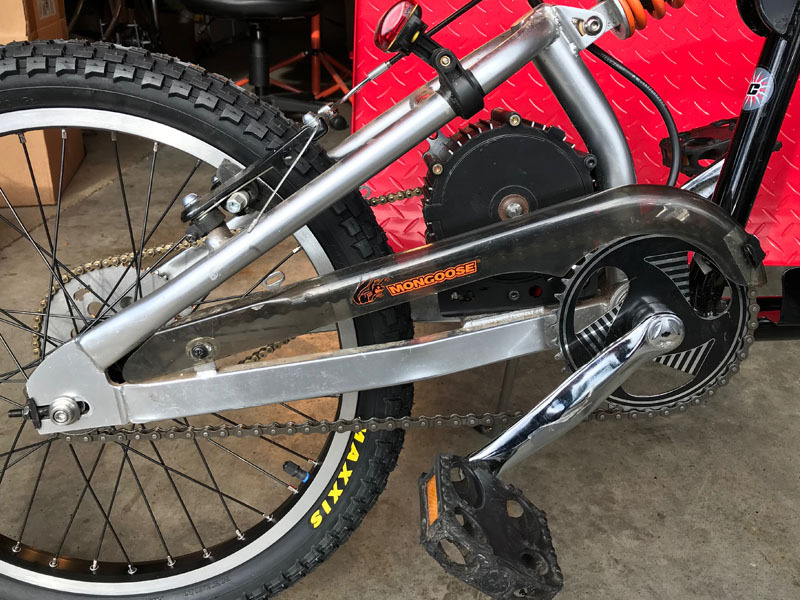 I picked up a Rockshox Monarch air shock at 165mm eye-to-eye to upgrade my daughter's mountainbike a while ago, and it is a great little shock. We found another, either 150 or 155mm for a friend's Mongoose mountainbike also, so the shorter shocks do come up from time to time. At the speed that bike will be able to go, and with the bigger wheel, maybe put a 203mm disc on the front, and be prepared to upgrade the caliper! Also, can that controller do regen? Preferably variable regen.. with that mechanical configuration regen is doable, and that back brake looks like it needs all the help it can get!!! Also there would be efficiency gains. Cool little "sleeper" bike.. he will be able to surprise a few people.. just hope the components are up to the new power level. I located the two bikes and purchased them from a sweet older gentleman who had bought a bunch of them for his (now grown) grandkids to play with, dude had a lovely 911 sitting in the garage, I could see right off he was a real fun guy wanting to clear a little garage space and he was nice enough to just about give them to me when I expressed an appreciation for the bikes and their potential. The bikes were both in real nice shape and he gave me a couple sets of brand new plastics, number stickers and goodies too. Figured Lightning Rods Mike could figure out something to pep the things up a little and it's been really fun having him work on the bike, he definitely has some amazing stuff going on in the workshop, even got to see the drive unit he built for the Ruff Cycle with IGH and drum brake in person-holy crap how does this guy think this stuff up let alone turn the design into reality? 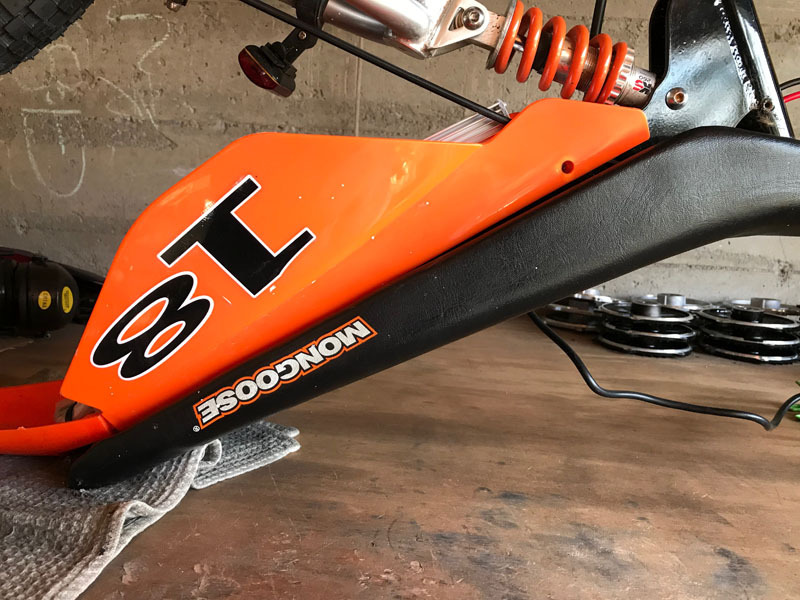 Anyway, I am looking forward to riding the Mongoose mini-moto project, it should be a little screamer and hopefully pretty darned roadworthy and rideable. NOS Double Crown Marzocchi/Zokes fork and Em3ev 16.5ah pack and Magura HS-33 Hydraulic Disk Brake for the rear, Hoping it gives me decent braking power and modulation similar to how a hydro disk brake feels, probably will experiment with different pads and see what seems good, the ones that came on the brake look fairly substantial so they'll be good to test out. The V-brake that came on the rear of the little bikes work well with decent pads anyway, this should be even better. As soon as Mike gets the power portion finished up I will install the fork and fit a hydro disk brake to the front to replace the mechanical disk the bike came with, much the same as the rear the stock brake worked well but with more power from the small block it will be good to beef the brakes up somewhat. For the fork I looked all over trying to find double crown forks with at least a 9" steerer tube and something that wasn't 200mm of travel in an attempt to keep the bike from turning onto a chopper. 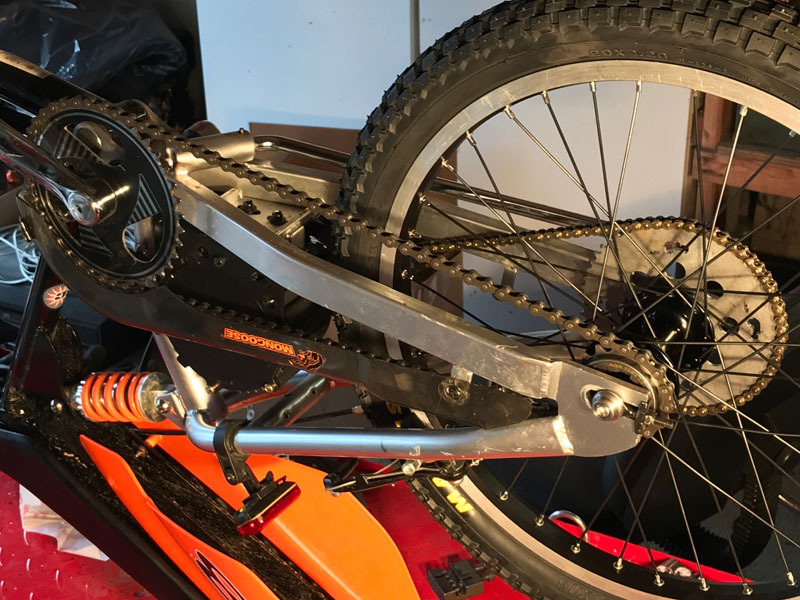 It took some looking to locate a fork, most modern double crown were bigger forks than I wanted for the project, could have used a single crown fork but wanted to preserve the mini-motocross look of the bike and have the strength of double crown. 20" wheel in the back and I'm going to build up a 24" wheel for the front on a disk hub. Will also try and fit a longer shock to attempt to raise the back end up as much as is reasonable. The frames are stout, but too small for many. 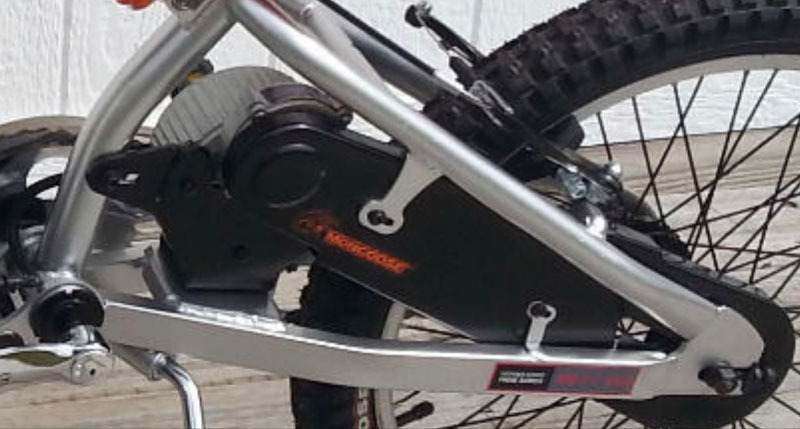 I've often wondered if a similar aftermarket midrive swingarm would be a financially viable product. I’m only 5’8” on a good day and if I slide to the back of the seat I can pedal one of these things, it’s not optimal riding position by any means but I could pedal the thing a couple miles if I needed to to avoid a walk of shame. On bike 2 I already switched out the crankset to a nice Redline one I had lying around and a 38T BMX chainring. I will be switching out the crankset on the bike Mike is working on to a nice Raceface set I have sitting around, the crankset that came on the bikes stock were a pressed on steel chainring, actually pretty decent....for a steel one. 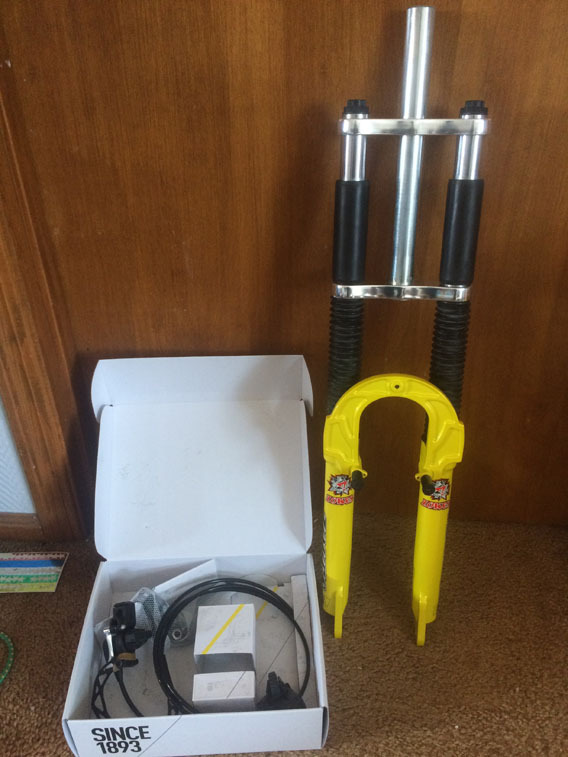 I’ll have to measure the stand over height with the stock fork and 20” wheel in front and then with the 26” fork and 24” wheel. Might end up being close to the same height as the Sur-Ron, but I seriously doubt I’ll have any attention from the cops because it actually pedals pretty well, already rode them right down the main drag in front of cops. I’d get nailed on the Sur-Ron instantly, no pedals. I’ve been cited for riding Motocross bikes on the street before in my younger days, they just load the bike on the tow truck since it’s an uninsured vehicle, been there, done that. 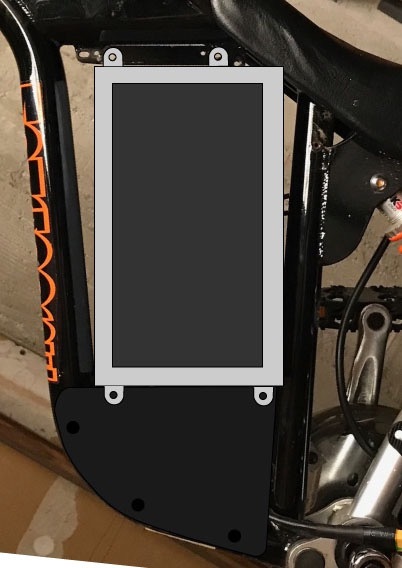 Added: measured Standover height-30", distance from center of BB to seat is right at 16" before modification, 24" wheel on 26" fork should boost the SO height a bit. Last edited by Raisedeyebrows on Mar 03 2018 11:11pm, edited 1 time in total. I would think somebody would want them, they could be improved too, disk brake mount for starters. My work on the little Mongoose is basically completed. The owner, Kelly, will be finishing some last details and modifications. Kelly decided to go all out on controller and bought a PowerVelocity sine wave 12 FET with Bluetooth programming and smart phone dashboard. It also has cruise control, 3 power levels and 130 phase amps. After trying all of the usual places to mount a controller and finding too little room I decided to hide it behind the number plates under the seat. You can hardly see the controller from the side. All of the connections are sealed and then bagged. No exposed rat's nest of wires. Super tidy. He's going to have a local metal shop make an aluminum frame to hold the battery in place. The hard case is so slick looking he's going to leave it exposed. The front forks and brake caliper have been upgraded. New forks and caliper installed on the 'Goose. Kelly went right out and ripped a 52 mph top speed run on the Mongoose. After the battery box is completed Kelly plans on installing a 24" front wheel. I was completely surprised by this little bike. Initially something I wasn't sure I wanted to work on, the Mongoose turned out to be a nearly perfect candidate for a Small Block motor swap. If you're not a giant and can find one of these used for a decent price, it is a really fun bike. 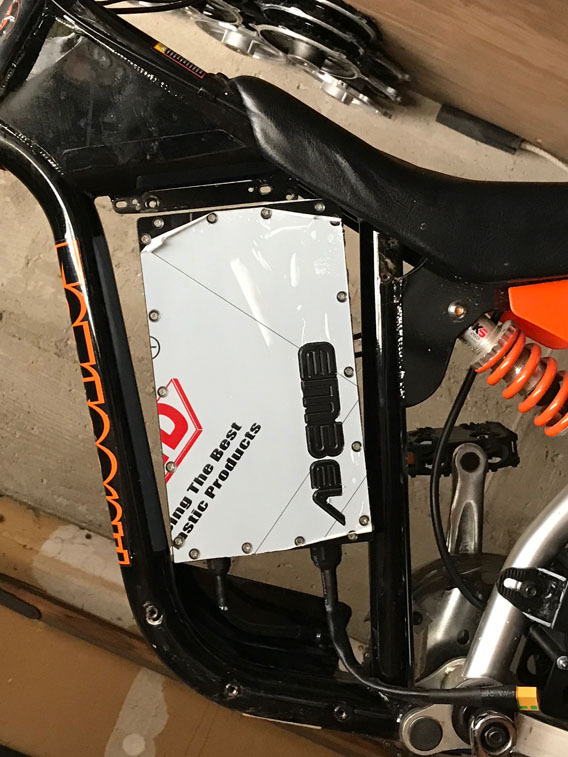 With 2500 watts in a tiny package like this Kelly is going to embarrass a lot of larger and much more expensive ebikes. I want one of these motors! After fitting the fork a test ride resulted in it being much nicer to pedal, raising the front end seemingly really helped, feels like I could pedal it across town if needed no worries. The battery fits nicely, a couple scuba straps holding it in securely until I can get a bracket done and mount the battery upside down. Reinstalled fender, I'm wondering if I could get a small orange Preston Petty and do a little cutting and fit it on there. Going to put the orange side plastics back on too, they make the bike a little more visible in traffic. Went ahead and fitted the Magura Hydro Rim Brake on the rear, feels great, need to shorten line and secure it, usual tidying up of wiring as well. Now a 24" disk hub wheel is needed for the front (raising the front end a little bit more) and I'm thinking a hydro ebrake for the front might be real nice to have. Mechanical disk on there works well but I have no ebrake lever, don't want to use the cheap ones I have sitting around. Thanks Mike! Very fun bike and actually fairly quiet too, I don't feel like it's going to scare little kids and elderly folks riding by. Mongoose is actually a pretty savage little beast and now the bike is a little better representative of the species. It was a fun project. Thanks for trusting me with your bike, Kelly. The weather’s getting nice. Let’s ride! First post here, though I've been lurking and reading the forum for a year. Now that I'm looking to build an Ebike rather than buy another, the Mongoose 24v450 has been popping up as a great candidate for my intended usage. As I've been researching the bike this thread keeps showing up. I think LightningRods and the owner could probably answer most of my questions before I decide to drop money on a donor bike. BB size? Is it press fit(BMX style) or threaded? It appears to be threaded in the photos, but I'm not sure. It is a 1.125 threadless steer tube, correct? 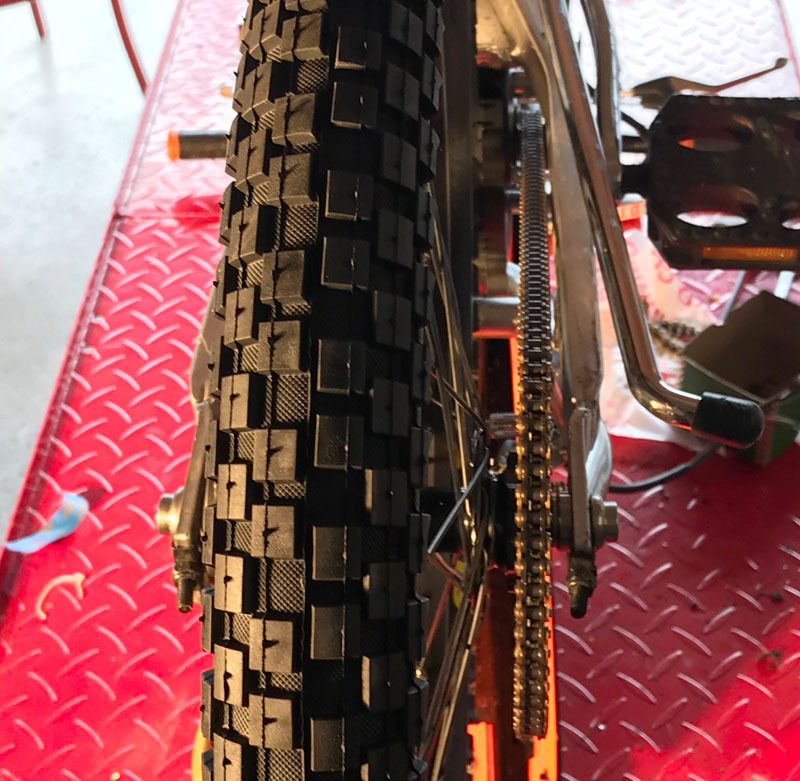 Is there clearance for a 2.5" wide rear tire in the swing arm? What is the drop-out width? 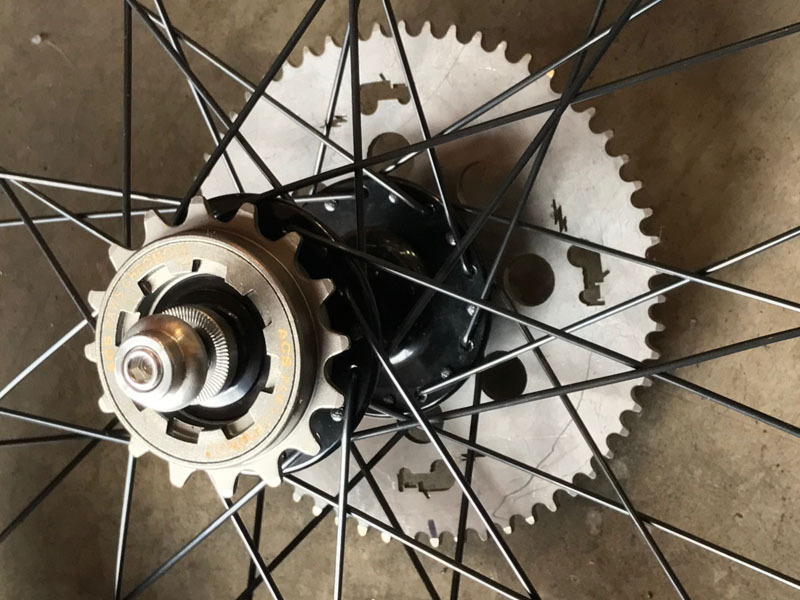 What is the stock front sprocket tooth count? 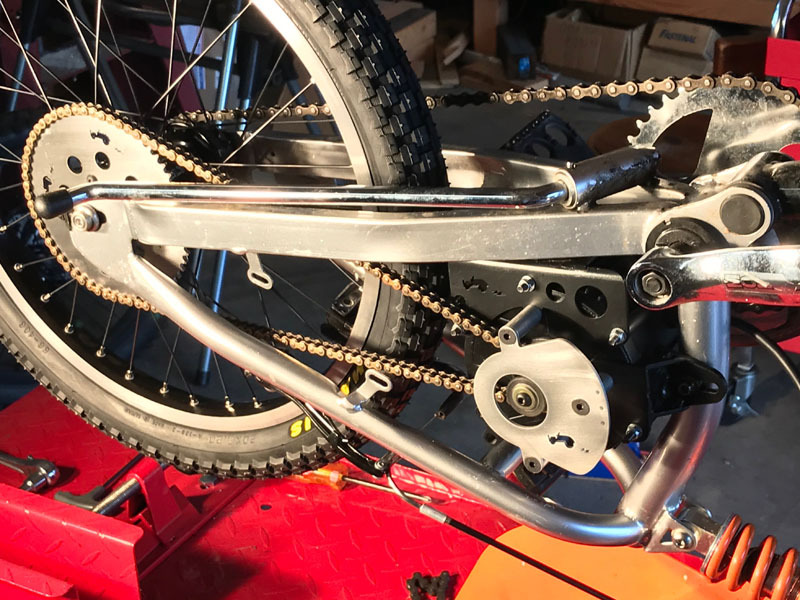 If the motor was mounted the opposite direction(right side drive) and set up to drive a trials type crank sprocket, like a conventional mid-drive, would one of your "Big Block" motors fit? What's the optimum RPM for that motor and at what voltage/amps is it most efficient? 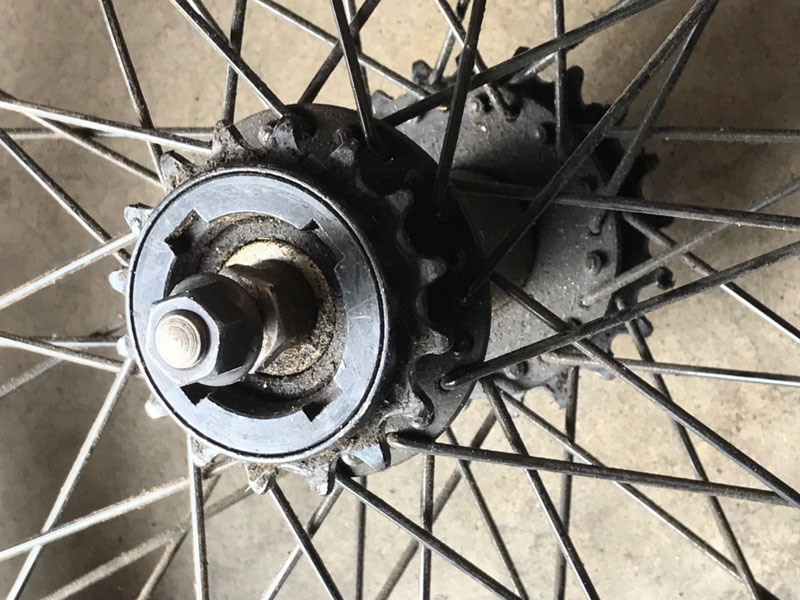 Which Surly rear hub did you use? 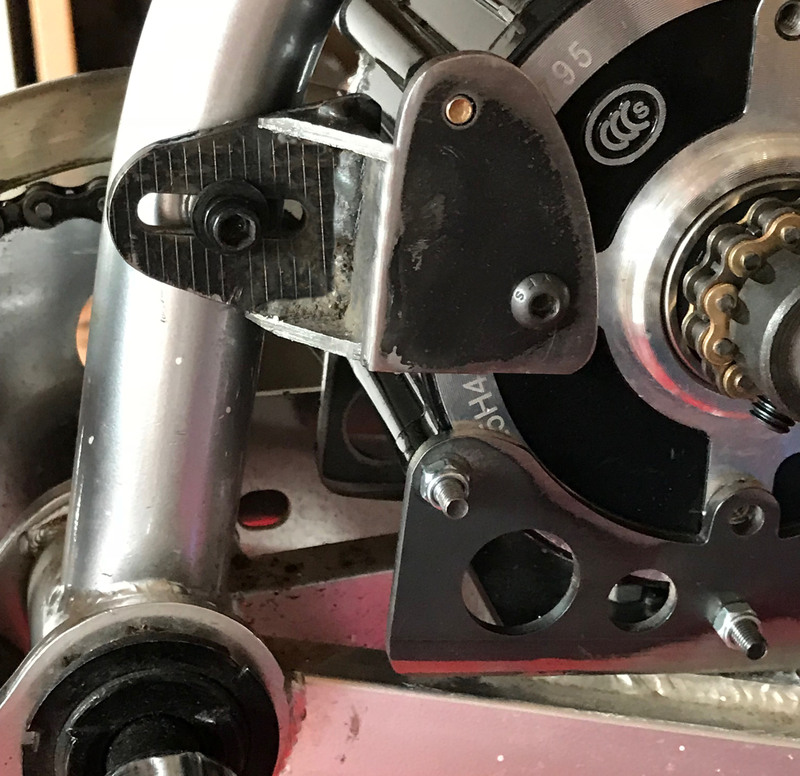 Do you know of any "dual disk" hubs that would fit the swingarm? Swap the front fork for something better(used Rockshox or equivalent), as well a better rear shock. Adjust fork height for level ride. 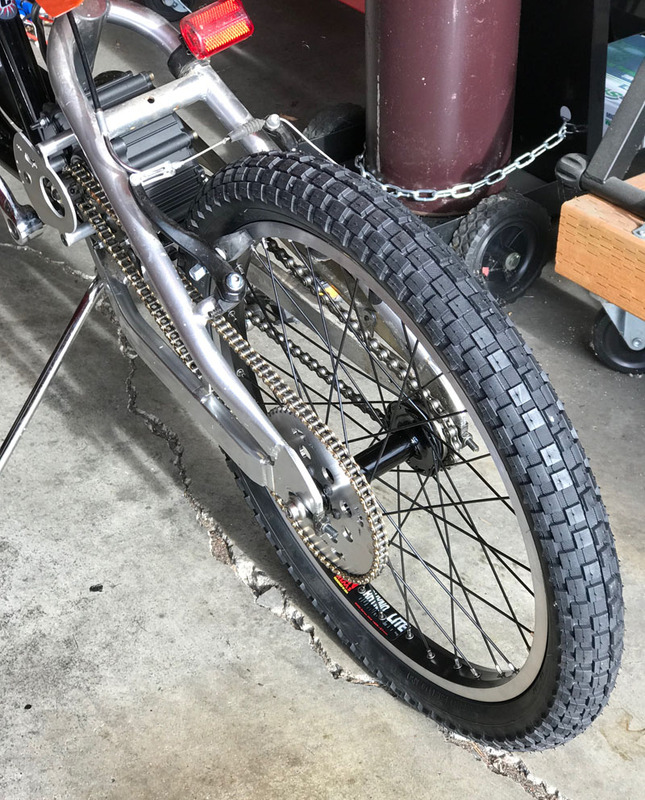 Stretch the swingarm 2-3" to allow for slightly taller(22") 2.50x17 moped tires(obviously on matching rims) and slightly longer wheelbase(stability). Big Block driving a trials type crank sprocket, driving either freewheel or a fixed 6 hole sprocket dependent on final gearing needs. If you flipped the motor and used a bottom bracket cartridge with a longer spindle I think you could squeeze a Big Block in there. I’m not sure that you could get clean chain runs from the motor output to the chainring. You’d have to play with it. The Big Block is happy from 36v up to 84v. I think it’s best at 72v 60A. It will run at 80A for quite a while. It’s amazing the way that motor sheds heat. Above 100v it has a tendency to throw magnets out of the rotor. It makes 62 rpm/volt. The rear hub was a Surly 135mm Ultra Single Speed Disc. 36 hole. The bikes have threaded bottom brackets, standard 1 1/8" headsets but one thing to keep in mind is the head tube is a full 9" long so you just about have to use a brand new fork with long uncut steerer tube. There is probably plenty of room for a 2.8 or 3.0 bike tire in the swingarm without a motor in there but in my case I'm going to be limited to the 2.35 Aiken's due to where the motor sits. There is a 2.25 on there right now and there's a pretty good amount of clearance left. Thanks for the quick replies and information. It goes a long way in helping me make my decision. That's my biggest concern. I was pretty confident that if I tossed the pedals/chainring in favor of MX foot pegs, one would fit. I want to avoid that however. I still want to be able to ride it on the street some times and pedals are kinda mandatory. LightningRods wrote: I think it’s best at 72v 60A. It will run at 80A for quite a while...It makes 62 rpm/volt. At around 5Kw and 4k rpm the torque with proper gearing should easily meet my goals of 25mph up hill, so that's good to know. Raisedeyebrows wrote: The bikes have threaded bottom brackets, standard 1 1/8" headsets but...you just about have to use a brand new fork with long uncut steerer tube. I missed that part while reading the thread the first time. I guess my only choice is to go new and expensive, or with one of the less expensive "China" forks on the market. That's good to know. I think 2.50 is about the sweet spot for most ebikes. I've owned 2, and ridden quite a few fat ebikes. Under 27.5, anything over the 2.50 width kills handling in my opinion. Not to mention the rolling resistance if you do get stuck pedaling.